Hunched and looming out of the morning mist, he looks over us. He can and does have the most remarkable effect on people, provoking discussion, emotion and at times, tears. The day he arrived, Jamie walked straight up to the crouched and chained sculpture, hugged him and reassured him all was okay, that he was in a good place; a safe place. I have noticed how all the guys have bonded with Symbol. Last year Jamie explained: “It’s how we feel, Chris man…you know, in jail” – bowed down and restrained. To this day I find the sculpture a disturbing and powerful presence but listening to Jamie, I understood, I got it: if ‘art’ can demonstrate so clearly how somebody feels, then it has an important place at LandWorks. And it does. Art just happens; it’s almost as if Symbol gave permission to people who felt excluded from such forms of expression, to get stuck in with colour, carvings and creativity. Before you go off with the idea that I am getting a little precious about this, I’m not, it’s just simply the amount of confidence and self-worth this self-seeded expression has created is fantastic, not a floppy hat in sight. In the beginning, to rejoice in his presence, Symbol was hoisted on top of the toilet block…nothing to do with latrines, just the only available plinth at the time. From this vantage point for months he has watched over us. Good times and bad, from misery to happiness, people come and people go, he has seen it all (metaphorically…he is after all wooden! ); watching daily as men reluctantly gather to head back to prison. He also once witnessed a van returning at great speed and a rather harried man known as Chris jump out…having inadvertently locked a visiting art student in the aforementioned WC. As I say, Symbol has seen it all. New people bring new ideas and it soon became apparent that Symbol deserved better. 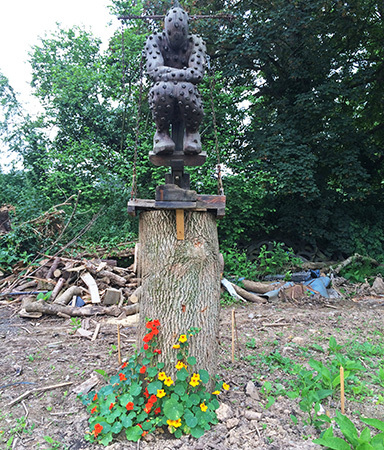 A fine new plinth has been formed with beautiful flowers to flourish at his feet. He now resides with all the dignity that befits such a beloved figure. In the evening sun he looks striking. Oh, is that another emotion…envy?